Samsung NP_X60 notebook computer has a 15.4″ widescreen LCD and weighs in at about 2.5kg (5.5lb) with a 6 cell battery installed. The NP-X60 also features Intel Dual Core CPU, Wireless, Bluetooth, PCI-Express, Gigabit Ethernet and Serial-ATA. NotebookReview reviewed that “The X60 should be on the shortlist of anyone looking for a lightweight 15.4″ widescreen computer (subject to the regional availability constraints). Build quality does not appear to be compromised by the low weight. The model reviewed contains the slowest of the Core Duo CPUs and an intermediate level graphics processor. Overall performance is well ahead of the previous generation of notebooks. Although the supplied HDD is nominally 100GB, there was only 86GB remaining after formatting and installation of the AVStation Now software. 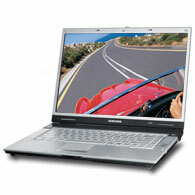 Check out more reviews on Samsung NP-X60.